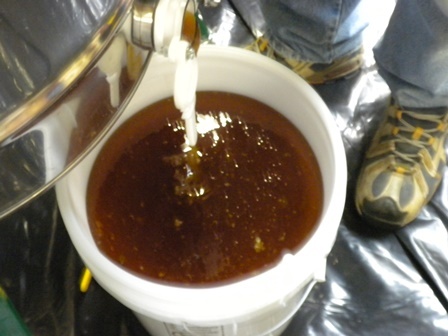 During the fall of 2012, our first full year with our bees, it was time to harvest our first honey off of five hives. The experience was full of learning opportunities. After many hours of study, asking questions of our fellow honeybee keepers at the Mountain Empire Beekeepers Association (MEBA) meetings, and multiple phone calls to our bee mentor, we had no clue as to what we were doing when we started, but we gave it the old Hokie try. Yes, I’m a Hokie, a VA Tech graduate. Hobbit King is a graduate of Averett, and, we take in Hokie football every chance we get. 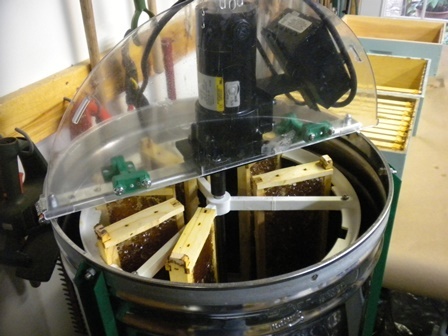 We used our basement as our staging area with a place to stage the frames, a place to scrap the cappings (the little seals that close the honey into the comb), and a place to store equipment as we transfer the frames into the extruder. We also needed a place to let the honey sit for 24-hrs. 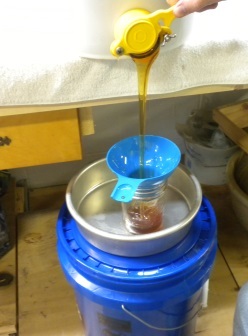 to filter the debris from the honey and a place to bottle the honey when ready. Hives prepped for harvesting using a bee escape. Supers placed on a nearby table readied for de-capping. 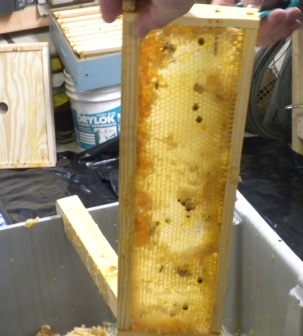 Extruded frame; notice the honeycomb remaining for bees to use again. Transferring the honey from the bucket to a storage jar. When all was said and done, we had harvested about 90 lbs. of honey from five hives. We were delighted and so proud of our little ladies. 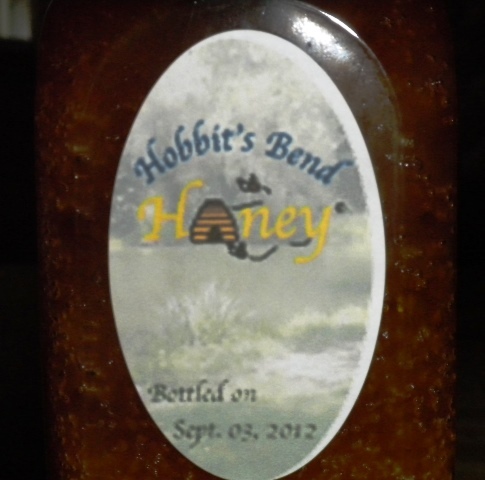 Jar labeled with the Hobbit’s Bend label stating the honey was bottled on September 03, 2012. Our labels looked okay. After we had used up the initial sheet of labels, we adjusted the printing so that it wasn’t lopsided. We stored our honey jars in the basement, thinking it would be a good place to keep them. This worked fine until the bitter cold of January and February of 2013. 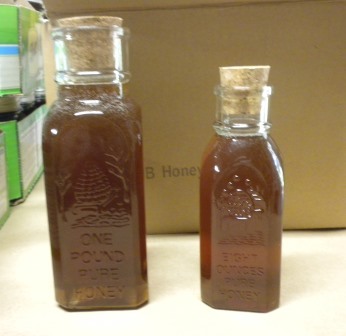 Our honey crystallized!!! 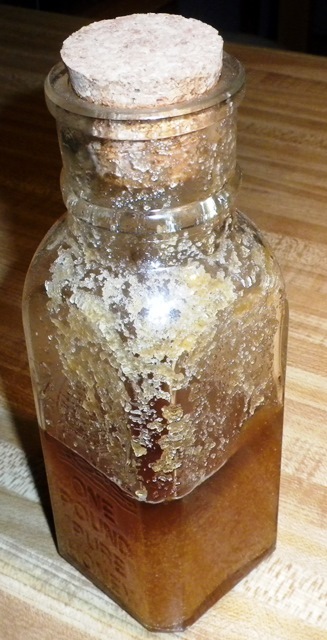 Honey that was allowed to get too cold resulting in crystals of honey along the sides of the jar. We didn’t have a lot of jars left, about 10, but we were sad just the same. Yes, you can still use crystallized honey, but it is not the same as putting a spoon of the smooth heavenly concoction in your mouth to taste. It does make for a great way to sweeten a nice cup of tea or to cook with, however. Then came spring time 2013. What a heart-break. We lost all but one of our hives. 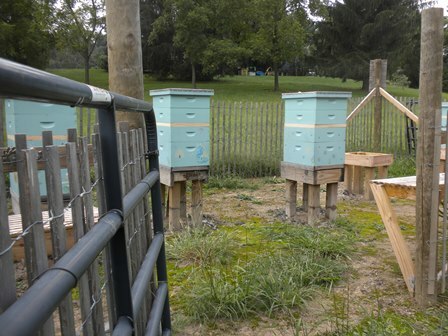 After making up five new hives (see my previous post I’m Back….Burrrr it’s cold for more details on what we faced ), we then struggled through the rainy spring and summer. When fall of 2013 arrived, we prayed the hives were strong enough to make it through the winter. Each day during December 2013 and January 2014, I found myself looking down at our apiary and silently saying a prayer of strength and protection for our little girls. Winter in December was not too bad, but we did loose one hive. 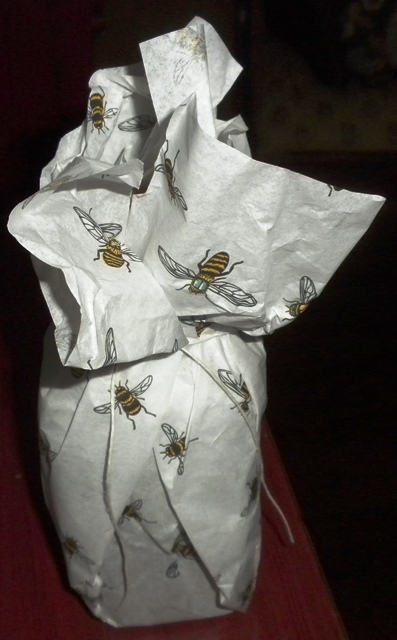 It was weak going into “bee” winter, so we had secretly worried it wouldn’t survive, yet we were hopeful. (Look for a future post on the effects of moths on a hive). We were resilient, you might say, like our bees. January 2014 changed our hopes to doubts with its serious cold temperatures and horrible winds. We did not receive a lot of snow during January, but the cold was terrible. Even a very strong hive would have trouble in those frigid temperatures; we worried. February 1, was finally warm enough, the temp got up to 54°F (12.2°C) and some of the ladies were out taking a cleansing run. Hobbit King decided to put a feeder on each hive while trying not to disturb them as he went along. He said that he did not try to lift each hive to check its weight as he didn’t want to cause the bees alarm and break their cluster. Sadly, we are expecting more cold weather with ice and cold rain. Six more weeks of winter was predicted and we hope that our ladies are able to persevere. In the meantime, we are learning that there are a few fast rules of beekeeping and it seems that the rest are a type of “magical” touch that you learn through experience. In the end, we are learning how to be honey beekeepers; to persevere. For more opportunities to read my writing and to learn about my recently published book The Letter: A Page of My Life, visit her writing blog at jkbrookspublishing.com or my Author Page on Amazon. Love catching up with your blog. It is nice to find blogs by other (I assume) Virginia Beekeepers to follow. I have not taken the plunge yet as we are still settling into our new house, but am learning tons from your blog! It’s great to have someone witht he same weather/environment issues. Thank you! Look forward to more!